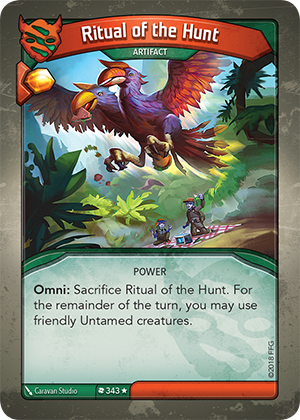 Card Text Omni: Sacrifice Ritual of the Hunt. For the remainder of the turn, you may use friendly Untamed creatures. Does Ritual of the Hunt’s “Omni:” ability allow me to use Untamed creatures that are exhausted? No. Ritual of the Hunt only gives you permission to use friendly Untamed creatures, even if Untamed is not your active house. Other requirements for using creatures (such as being ready) still apply.